Six fishing and conservation groups -- all involved in long-running litigation in the past that has challenged the federal salmon protection plans for the Columbia River basin -- on March 24 mailed a 60-day notice of their intent to sue the Bonneville Power Administration's official adoption of the latest government strategy. 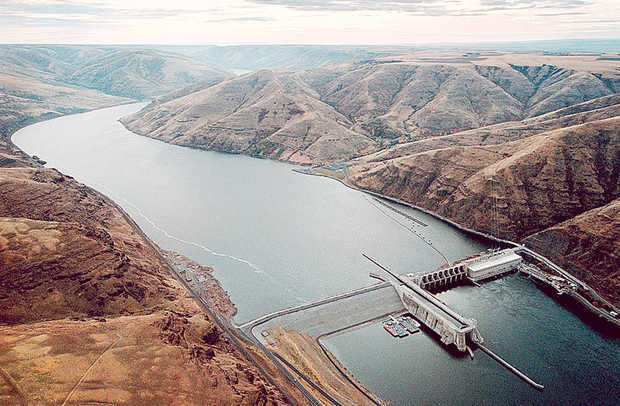 The notice says that BPA, with its acceptance of NOAA Fisheries 2014 Federal Columbia River Power System supplemental biological opinion, has violated the Endangered Species Act. The BiOp outlines measures that NOAA says must be taken to mitigate for hydro system impacts and thus avoid jeopardizing the survival of 13 salmon and steelhead stocks that are protected under the ESA. BPA is one of three so-called "action agencies" charged with implementing BiOp provisions. Bonneville markets power generated in the federal power system. The other action agencies are the U.S. Army Corps of Engineers and the Bureau of Reclamation, which operate the FCRPS dams. The notice letter says that a Feb. 27 BPA "record of decision" officially endorsing the BiOp, which was released in January, represents a failure to comply with the substantive and procedural requirements imposed by ESA, as well as the ESA prohibition on 'take' of listed species, in its coordinated operation and maintenance, along with other federal agencies, of federal dams, reservoirs, and related facilities and actions in the Columbia River basin. The 60-day notice sent to the BPA, NOAA Fisheries and secretaries of Commerce and Energy, was signed by representatives of the Federation of Fly Fishers, Sierra Club, Pacific Coast Federation of Fishermen's Associations, Institute for Fisheries Resources, Idaho Rivers United and Northwest Sportfishing Industry Association. The groups are represented by Earthjustice, which also provided counsel for a broader coalition of fishing and conservation groups, led by the National Wildlife Federation, that challenged in U.S. District Court NOAA's 2008/2010 BiOp. That strategy was remanded to NOAA Fisheries with orders that a new, legal BiOp be produced by January 2014. The state of Oregon was also a plaintiff in that lawsuit. No challenges of the new BiOp have been filed in district court to this point. If a challenge of the BPA ROD is pursued it would be through the U.S. Court of Appeals for the Ninth Circuit. The Northwest Power Act requires that challenges to BPA decisions be addressed by the Ninth Circuit. -- failing to adequately consider the FCRPS's impact on the prey base necessary for the survival and recovery of critically endangered Southern Resident killer whales. -- CBB, Jan. 17, 2014, "NOAA Fisheries Issues New Salmon/Steelhead Biological Opinion For Columbia/Snake River Power System"
-- CBB, Sept. 13, 2013, "NOAA Fisheries Releases Draft 2013 Salmon/Steelhead BiOp, Says 2008 Biological Analysis 'Still Valid'"
-- CBB, Aug. 5, 2011, "Redden Orders New Salmon BiOp By 2014; Says Post-2013 Mitigation, Benefits Unidentified"
-- CBB, Aug. 23, 2013, "Federal Agencies Release Draft Plan Detailing 2014-2018 Actions To Meet BiOP Salmon Survival Targets"